The Revolt and The Revolting: Maulawi Hassan is basically an unknown in any reference I looked through. Difficult to say he is another Abu Musab al-Zarqawi. Maulawi Hassan is basically an unknown in any reference I looked through. Difficult to say he is another Abu Musab al-Zarqawi. The war within in Afghanistan is now nearly seven and a half years on and the Taliban have repopulated the region, including the tribal areas of Pakistan. Needless to say, due to the lack of attention Bush/Cheney/Rumsfeld gave this war it has blossomed into a massive 'conflict of interest' between the Taliban and NATO. I realize putting this war into terms somewhat foreign to 'the language and context' assigned to it by the media seems as though I am treating the matter somewhat frivilous and strange, but, I assure it is not. I'll explain in a moment. The other reality is that it doesn't matter, to some extent, whom Maulawi Hassan really is because Osama and Omar are still 'in the mix.' So, to say Maulawi acted as a commander is somewhat irrelivant (except to the NATO forces in the region), and I want to put this 'mess' the new administration inherited into an understandable perspective. It is a perspective I hope others will come to appreciate as a 'reality context' of Afghanistan. To begin, President Obama may take 'responsibility' for the USA and its forces as he should, but, he wasn't even a Senator when the war in Afghanistan was begun for the retaliation of the events of September 11, 2001. To say he is 'liking' his Commander and Chief role right now is probably a huge mistake because he never consented to any war in Iraq either. So, let's just say, he is 'carrying out a dynamic' that was begun by 'wealth merchants' in the White House that was never designed to achieve an end. To call it a mess is an understantment. And to realize President Obama never consented to the Iraq invasion, everyday he has to deal with this 'mess' is another day of tedious seeking for a resolve that was never 'built into' either wars in Afghanistan or Iraq. There was never an 'exit strategy' for either these wars. Okay? What I am about to 'assess' is completely irrelivant to any 'exit strategy' President Obama is seeking, but, will outline a 'better reality' to citizens of civilized societies confronting the 'anima' of al Qaeda. Below is a dam. 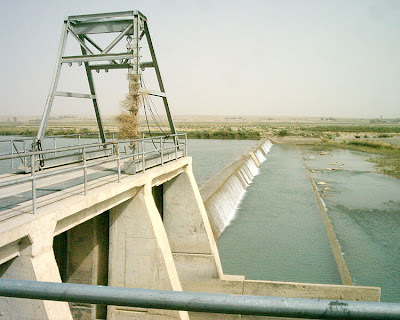 It is the Grishk Dam in Helmand Province, Afghanistan. It is the province Maulawi Hassan was killed along with 'his gang' of sympathizers. One has to realize there are 'assets' to both the countries of Afghanistan and Pakistan. The ultimate goal and plan by Osama and Omar is to control these assets and make a country, similar in the 'anima' of Iran that will destroy civilization, be it Eastern or Western philosophy and sophistication. The Grishk Dam is such an asset and explainable why the Taliban would seek to assert themselves in this Province. Make no mistake, the Taliban are sympathetic and enthusiastically so to any agenda of 'bin' and Omar. Why? Because of the religious fervor of Sharia Law (And I don't give a hoot if I spelled the dam word right. It is a 'basal instinct' male 'mind set' value system that lacks sophistication and civilility. It has no place in today's world.) We have witnessed the 'cruelty' of the Taliban in Afghanistan before and after the invasion into Afghanistan and know full well this is an oppressive regime of religious devotees that kill people that don't obey silly rules. But, to return to the dam, it was constructed for hydroelectric power by the USA prior to the invasion into Afghanistan by the Russians. As a matter of fact, the Russians should have asked us to ally with them when they invaded the region because we were actively involved in 'modernization' of Afghanistan and this dam was one of the projects. The 'populous/political' MIND SET of Americans at the time Russia took its initiative into Afghanistan was left over from The Cold War. The Russians 'of the day' (the 1960s) would no sooner seek help from the USA or exchange intelligence because it would be publically and internationally ridiculed as a form of 'surrender' to Western values. Etc., etc., etc. NATO said Monday its troops targeted the compound of insurgent leader Maulawi Hassan in Helmand province. He and nine associates were killed. The attack took place Saturday. NATO says Hassan was a senior insurgent figure in northern Helmand. Two NATO soldiers and a contractor were killed Sunday in the same region. Southern Afghanistan is the center of the Taliban insurgency, where thousands of new U.S. troops will deploy later this year to try reverse militant gains. So, those are American dollars that built that hydroelectric dam and at the time the USA was 'in it' for the long haul in peaceful measure to assist the Afghan government to elevate the people to a better quality of life. The project was called, oddly enough, "little America." Now if I was an astute politician I would want to use that event to come up smelling like Roses. And to some extent citizens of NATO countries including the US would like to find a good excuse for ending this mess based on those 'relief' scenarios alone and that is what the Taliban is 'banking' on. But, to return to Maulawi Hassan. Who is he really? Who is this obsure figure to the NATO mission? Let's take a look at the ruthless Maulawi and why he is a 'go for' of 'bin's. Maulawi Hassan is a local. He has lived his life in Afghanistan, more than likely never leaving the province in which he was killed. He grew up with the Taliban and inspired by their rule under Sharia Law. He doesn't really have much of a choice, now does he. He is a peripheral individual that protects Osama bin Laden and Mullah Omar from being captured and killed. He believed in what he did to NATO and in that definition opposes the 'established and benevolent' government of Afghanistan and Karzai. But, there is more to Hassan. He was operating with an understanding of another figure. Both, he and his operative boss would be considered 'kids' by civilized standards. His operative boss is a person by the name of Taliban Mullah Rahmatullah. Mullah Rahmatullah is listed as #621 on the list of Gitmo Detainees (click here). He is detainee number 964. When classified by the USA military he was stated to have been born in 1981 and the age of 20 when apprehended and sent as a military combatant. Starting to get the picture here? Now, that the information is known about Hassan and his 'operative boss' one can Google the Mullah's name and realize as Detainee 964 he was 'on display' by the former administration in a military tribunal. I am not interested in 'hashing out' the past and there is no way this young person shouldn't stand trial for his offenses and be sentenced. There is also a dynamic for 'maintaining' the Mullah as an ? enemy combatant ? that is a bunch of hog wash because there in lies the Rumsfeld reasoning for torture. So get over it. The war in Afghanistan can go on forever. As more young people come 'of age' as far as al Qaeda is concerned the more will enter into the Taliban 'dictorate' and continue to expand its influence and desire for adverse outcomes to benevolent nations. The detainees in Gitmo need to be assessed for their responsibility for September 11th and held for trial. Any detainees suspected of murdering any NATO military need to be tried and sentenced. Those trials should be public and with outcomes that can be witnessed by The Taliban and al Qaeda. If the public display of the trials are not held, the young people under the Taliban will have no concrete method of knowing their fate. About the region of Afghanistan and Pakistan. It is more than simply a war against 'evil.' It encompasses a lot more than two countries, it encompasses a 'strategy' to 'secure' benevolent nations, including those of Eastern philosophy away from terrorists, of which Iran's leadership practices. Iran denies the Holocaust and in doing so unleashes the groundwork for annihilation of Israel. That IS anti-semitism and a form of terrorist threat. While diplomacy is the best outcome for all the nations involved, including Afghanistan, Iran, the terrorist element in Pakistan, Kashmir and India; the likelihood of such diplomacy having a profound effect on the region is doubtful. The variables are the roles of Russia and China and their influence with Iran, therefore, its influence with neighboring countries. While Pakistan's new government is benevolent to any civilized outcome there are dynamics playing out in Kashmir that add to the instability in Afghanistan and Pakistan. India has to become a devoted ally in these circumstances and willing to work with the USA to bolster the region from threats of terrorists WITHOUT compromising the stability that is possible under the new Pakistani government. That said, what do we do about the war raging in Afghanistan with its own recrutiment effort in Pakistan? If the Taliban won't commit to 'cooperative' governance with the established government of Afghanistan while stopping all hostilities measurable by accepting directives of rebuilding and benevolence as defined by NATO then what are the alternatives? There aren't many. To allow the Taliban to continue to build their military and form more and more terrorist elements within its dictorate and otherwise is to ensure the continued threat against benevolent nations and their economies. That is unacceptable. A continued war with the Taliban and NATO is questionably sustainable. The only answer is to destroy Taliban strongholds and eliminate the threat based on an understood declaration of war against civlization by these people. The Taliban leadership are not passive entities 'caught up' in a dynamic they don't understand or don't consent to, they are a 'warrior' culture that prides their control by strict and unreasonable 'culture' laws that behead innocent people when defined by other nations. It can't be tolerated. The region's population of Taliban will have to be reduced and the way that occurs will be at the pleasure of NATO and the USA. War is war and unless diplomacy can garner acceptance of a peace directive by these nations, the USA has been placed in a hideous position by the previous administration and the United Nations has to come to terms with that as we act to defend our nation from the terrorist elements in this region of the world AND the egregious exploitation of the Neocons of the previous DC administration. Could it be another Vietnam exit? With NATO involved and valuing them as allies, I profoundly doubt it.